a 50 percent tax on bonuses exceeding $400,000. Just 7 percent of U.S. adults say bonuses are an appropriate incentive reflecting Wall Street’s return to financial health. ….Seven of 10 Americans say it’s Wall Street’s turn to help bail out the government Treasury, supporting a tax on Wall Street profits as a way to reduce the $1.3 trillion deficit. By comparison, 43 percent favor a freeze on spending for items like education and medical research, 33 percent would cut farm subsidies, 25 percent back a new tax on gasoline, and 15 percent would reduce benefits in the Medicare health insurance program for the elderly. 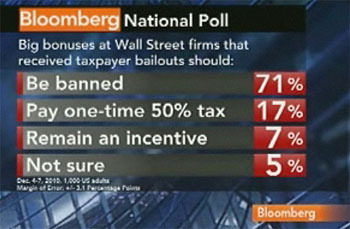 This works out to 88% who want big bonuses taxed or banned and 70% who want Wall Street profits heavily taxed. President Obama, of course, has basically done everything he can to save them from this fate, restricting his actions to occasional verbal criticisms and support of a very modest financial reform bill. His reward for this act of loyalty to capitalism has been for the captains of industry to turn on him like rabid dogs, funnel millions of dollars to his opponents, and demand that he stop saying mean things about them. The result of all this mau mauing will be a meeting on Wednesday with top business leaders in order to “mend fences” and assure everyone that they’ll be treated with more respect in the future. Ladies and gentlemen, your American democracy at work.